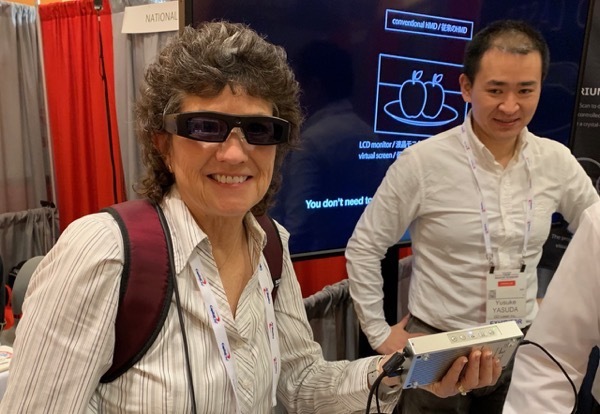 We have three video/audio interviews from CSUN’s Assistive Technology Conference, but there was one product where we didn’t do an interview and yet it was a pretty interesting product. The product is the Retissa Retinal Projection Eyewear from QD Laser. This is a glasses-type piece of eyewear that projects the outside world directly onto your retina using low-powered lasers. The problem to be solved here is a cloudy cornea or cataracts that normally occlude vision. The Retissa completely bypasses the lens in your eye and focuses directly onto the retina. 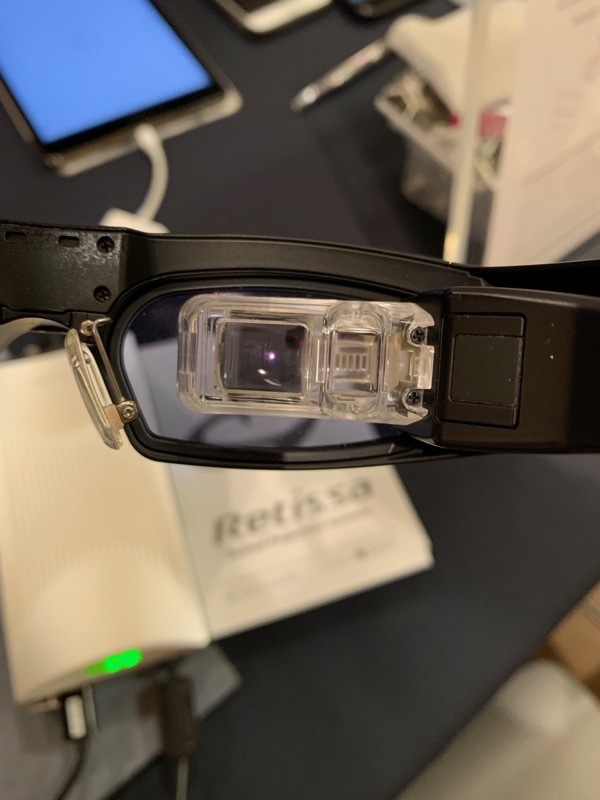 I tried on the Retissa eyewear and in a tiny projection screen on my right eye I could see very clearly whatever they pointed me toward. The gentleman showing it to me was holding a deck of cards-sized box, and with controls on the box he could zoom in and out for me. Next, he began playing a video for me (not sure of the source) of a turtle swimming in the ocean and it was extremely sharp. 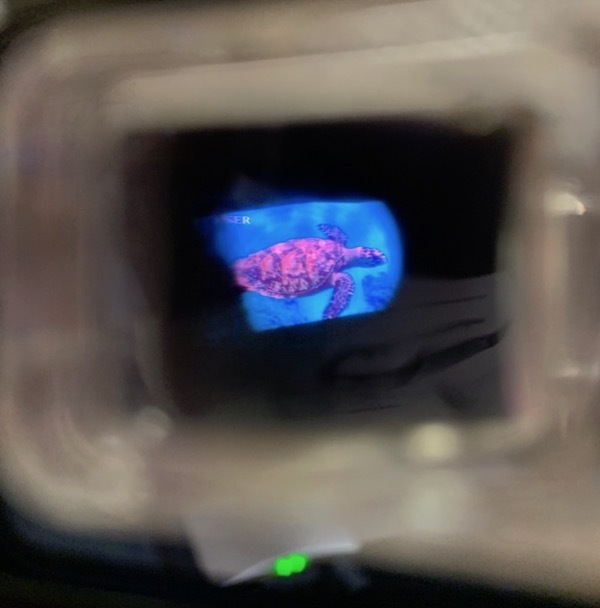 Finally, they showed that they could control what I was seeing via a connected iPad, using its camera to project the image onto my retina. You may be wondering why we didn’t do an interview and it was because both of the gentlemen had a great deal of trouble pronouncing English words and it took quite a while talking to them to understand what they were telling us. At the end of this, I wanted to take a picture of the eyewear, and one of the men held my hand and kept moving my iPhone closer and closer to the inside of the glasses until I was essentially touching the glasses. I was going to try to explain to him that the iPhone couldn’t focus that close, until I realized that their laser focusing technology was sending a perfect signal to the lens on my iPhone! I put a couple of photos in the shownotes so you can see what I mean. This isn’t the kind of product you’re going to go out and buy yourself, but rather a proof of concept I think. Many of the products we saw were only available through your vision specialist, and this might also be in that category. Really cool to see these advancements in technology each year at CSUN. Thank you so much for your podcast. Do you happen to have their contact info that I can contact them directly for trying it out? I emailed them two months ago but have not heard back anything. THANKSSSS!